Pink is a popular color this season. This beaded bracelet contain Swarovski crystals, rhinestone rondelles, faceted agate and jade beads. It is made on expandable wire and has a silver-plated lobster clasp. It can be extended from 7 to 7 1/2 inches when using its extender. This fancy pink choker can be great for any event or just to spice up your outfit. It is mad.. These stylish pink earrings feature faceted briolette stones that hang on sterling silver chain co..
Feel glamorous in these dainty pink crystal heart earrings. They hang on sterling silver chain .. 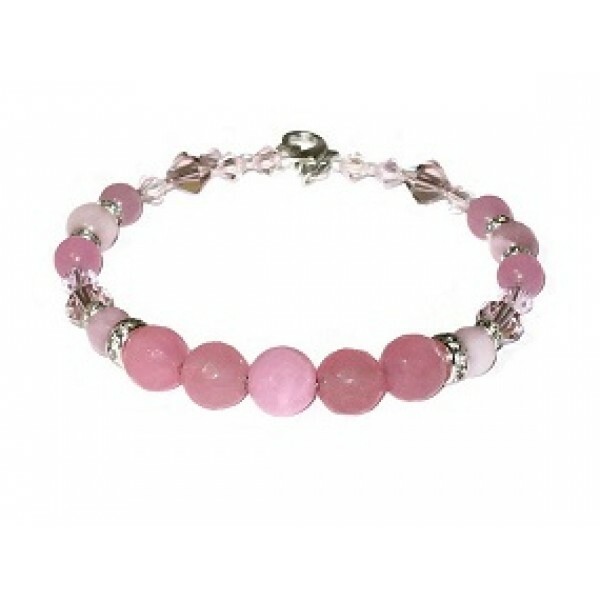 This necklace is made with different shades of pink. It features a mother-of-pearl flower pendant ..